Mitch Stenoien (‘17) runs a relay against Wartburg. 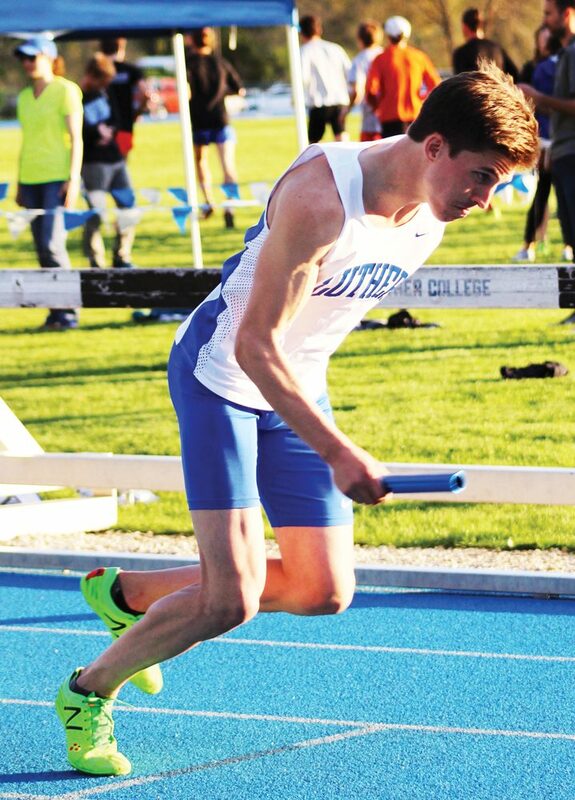 Luther Men’s and Women’s Track and Field hosted Wartburg in the annual Luther-Wartburg Dual meet at home on May 4. The Norse men lost 111-77, and the women lost 119-72 in their final meet before the conference championships next week. Some of the top performances for the day for the men’s team included a first-place finish from Collin Kern (‘20) who set a meet record in the 1500m run with a time of 3:58.13. Other first-place finishes included Mitch Stenoien (‘17) in the 800m run with a time of 1:55.91, Trent Ostby (‘20) in the pole vault with a 12 ft. 11.5 in. jump, Koltin Pfaffle (‘18) in the shot put with a 45 ft. 1.5 in. throw, and Lucas Kane (‘18) in the javelin with a 168 ft. 9 in. throw. Some of the top performances for the women’s team included a first-place finish from McKenzie Carney (‘18) in the 3000m run with a time of 10:23.56, which is the tenth fastest 3000m run in Luther’s history. Other first-place finishes for the women included Sarah Holtz (‘20) in the high jump with a 5 ft. 1.25 in. jump and Aubrey Highum (‘20) in the javelin with a 110 ft. 11 in. throw. The meet against Wartburg was a unique opportunity, according to Head Coach Jeff Wettach (‘79). The meet is the only dual on Luther’s schedule. Wettach explained how a dual has a different scoring system. The first place finisher gets 5 points and the second place finisher gets 3 points. Then, because only two athletes from each team score, the next highest finisher from a team that has not had two athletes score gets 2 points, and the last place gets 1 point. Wettach explained why that was a unique opportunity. The Wartburg dual was also special because it was the last home meet of the season for the Norse. Distance runner Anna Phearman (‘19) talked about the significance of home meets for the team. The Luther-Wartburg dual was also the last meet of the regular season for the Norse. The team is now preparing for the upcoming Conference Championships. Elijah Kane (‘18) reflected on the progress that the team has made over the course of the season. 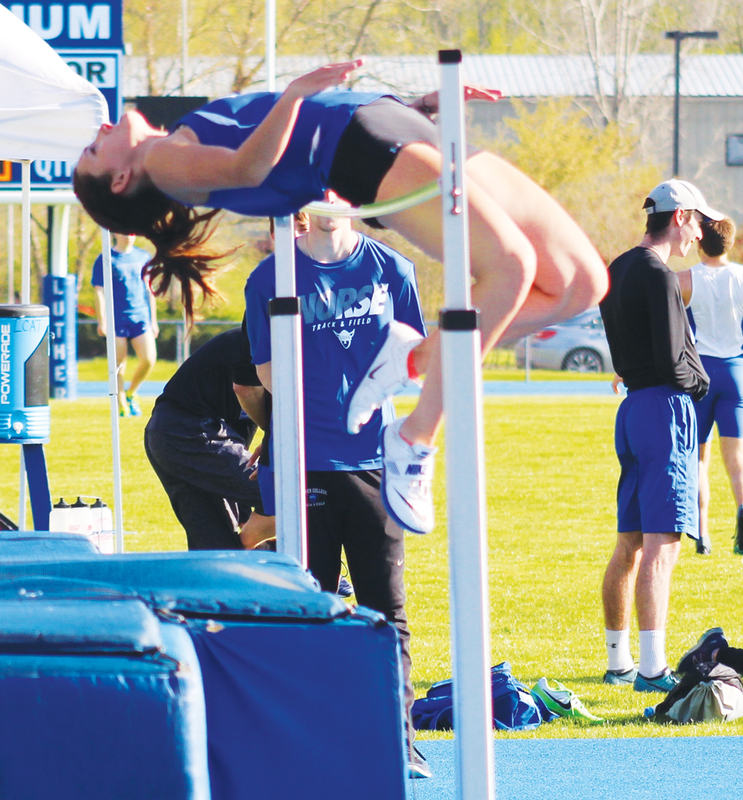 Sarah Holtz (‘20) high jumps against Wartburg. As the Norse move on to the Conference Championships, women’s captain Erin Ellefsen (‘17) explained the team goals. Men’s captain Alex Bishop (‘17) also explained team goals going into the championships. The men’s and women’s teams will travel to Buena Vista University in Storm Lake, IA, to compete in the Conference Championships May 11-13.